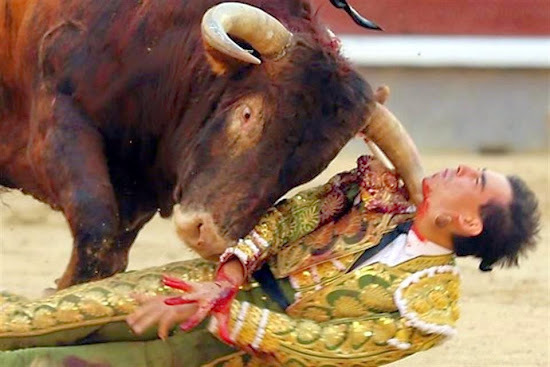 This is the shocking moment a bullfighter was gored in the neck during a gruesome fight in the latest in a series of bloody incidents in the sport. Jimenez Fortes was competing at the San Isidro Bullfight Festival in Madrid, Spain, on Thursday when he was thrown from a bull and injured in the right hand side of his throat. Although spectators saw him walk from the stadium it is thought he has been left with serious injuries. Some reports suggested it was the second year in a row the young bullfighter from Malaga had been injured at the annual event. Bullfighting is a traditional spectacle in Spain and Portugal, and has also spread to Hispanic American countries, including Colombia, through colonisation. It often involves three stages including picadors (horsemen), banderilleros (lancemen) and matadors. The festival, which started on May 8, sees thousands of people flock to the region to see the fights, which take place every evening for 20 days. As well as those taking on young bulls, which can weigh up to half a tonne, others step into the ring wearing period costumes. Mr Fortes's injuries come just a month after a man was gored in the bottom during a fiesta in Teulada, eastern Spain. And in February a 20-year-old American was taken to intensive care after being badly injured during the bull-running season. Medics treating him said he suffered some of the worst injuries they had ever seen.